Love em’ or hate em’, you can’t deny that the invention of smart phones has changed the dynamic of camping. Long gone are the days where nipping out on a camping excursion means no contact with the outside world (unless you switch it off that is!) and for many (myself included) the invention of these annoying yet addictive devices has done nothing but enhance our trips away. So what appsdo I use on my iPhone to enhance my holiday? Read on for my top 10 camping holiday apps. Us Brits seem to have a reputation about talking endlessly about the weather! It’s the one aspect of our holiday that we have no control over, but it doesn’t stop us wanting to keep an eye on it nonetheless. I use Dark Sky which although is a paid one (£2.99) rather than the endless free weather apps, I find it slightly more accurate than BBC Weather, Accuweather, the Met Office or The Weather Channel. It also alerts you if there is likely to be raining in the next hour, giving you time to get indoors or grab a brolly. 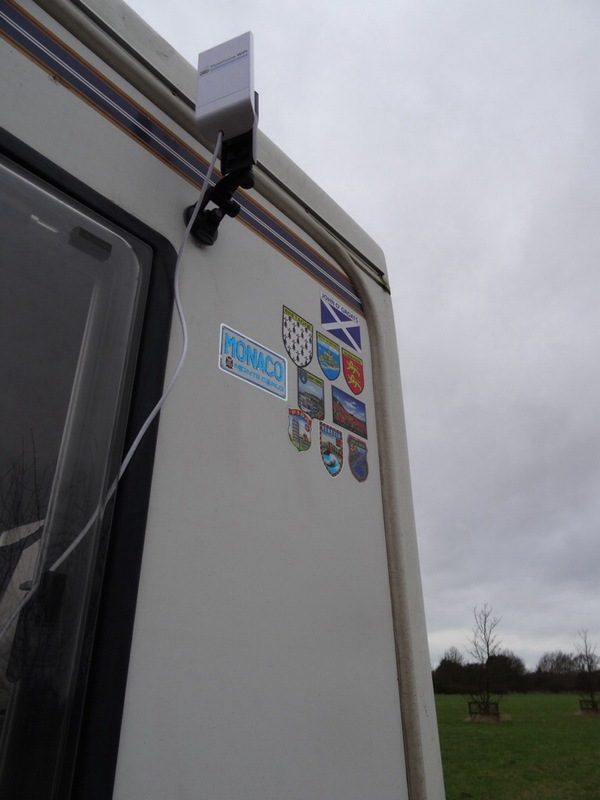 The Camperstop App is a great bit of kit, especially when you are touring Europe. It is linked to the Camperstops bible and lists near enough every Motorhome stopover, whether its free or paid, what type of stop it is, and even lists just the service point stops. In UK there are a few listed on, but as Aires aren’t quite so popular over here there aren’t so many listed on. We’ve been using “Colin” the CoPilot for coming up to 2 years now, and have usedit in numerous countries. I’m still as chuffed with it now as I was at first. Advantages of Copilot over the free Googlemaps are that a) you can enter your vehicle measurements and the route is then calculated based on these measurements b) you don’t need any signal as the maps are saved online c) it’s relatively easy to use and d) you can save addresses etc so it’s easy to find locations in a hurry. Here is a link to my old review in case you missed it. Sat around the campsite with a great night sky debating which star is which? No problem – whip out Pocket Universe, point it at the sky and it will tell you. It’s a marvellous bit of kit and doesn’t need internet either! Do you have any apps to add to my list? What are your favourites to use to help you on your camping trip? For the last five years we&apos;ve had to endure driving past signs for the Old Buckenham Airshow knowing we were unable to go because of other diary commitments or us taking our holidays too early. This year however our diary was full of local commitments so for the last 6 weeks or so we&apos;ve been quietly looking forward to this event. Old Buckenham airbase was built for the USAAF 453rd Bombardment Group during the war and was home to the legendary James Stewart for a time. It&apos;s just off the A11 in between Thetford and Norwich. Showday soon came around and we&apos;d spent all week planning what to take in our picnic hamper. Yes, that&apos;s right- Old Buckenham Air Show is one of the few events we&apos;ve attended recently that still allows a good old fashioned picnic – despite the fact that there was a very enticing local food (and drink) village as part of the show at reasonable prices. We bundled Jazz the pampered pooch into the van along with enough food to feed the five thousand, and set off nice and early to secure a good spot! As well as being family friendly (apparently the kids changing areas were very good this year) Dogs are also welcome and catered for with a great big Doggie Watering station. Car parking was easy and free- all the local air cadets were doing a fabulous job guiding cars in and before we knew it we were setting our stall out in prime position (with lots of others I hasten to add- definitely worth arriving around 10am as gates open). We left our picnic with our chairs and went for a wander around the show. First up for us was the large display of WW2 vehicles- Keith was in his element, he&apos;s a huge history buff and the vehicles were in great condition. He had to drag me past the queue for tank rides! It looked so much fun so maybe next time for that! There was also a large collection of classic cars to look at including a couple of beautiful split screen VWs . May favourite was the one painted in the colour of my favourite wine . Further round the site was a small funfair for the kiddies, a collection of stalls selling camping bits, aviation and wartime souvenirs. After an hour or so of mooching I couldn&apos;t wait any longer to get picnicking- this was timed well as the commentators announced the bar opened at 12:00. Keith went to get some beer whilst I set our food out. He really enjoyed all four of the local ales on offer but his favourite was the Shark. After a lovely leisurely lunch it was almost time for the main feature and boy what an exciting program it was! First up was some airplane aerobics and some impressive loop de loops! This was followed by local pilots The Wildcats doing some amazing synchronised formation work. Next up was our show highlight- star of the film "Memphis Belle" – the last flying B17 in Europe, SallyB. Absolutely sensational seeing her in the air. And when she put her smoke on for her final salute and they played We&apos;ll meet again through the speakers- well, Keith and I were blubbing like babies! The Hurricane that was scheduled to fly was sadly unable to fly due to technical problems so instead the Messerschmitt took to the skies. Next up and another treat- the Spitfire- this particular one is used in all the films. Again- just listen to that sound.isn&apos;t it fabulous. After such an indulgence of history and beauty it was onto the lighter fun acts, including Otto the helicopter from O&apos;Brien&apos;s flying circus doing all sorts of crazy things that you wouldn&apos;t normally see helicopters do! Tickets cost £18 (advance online rate) or £20 on the door for Sunday. Saturday is a reduced rate but there were less acts flying. Would highly recommend this for next year. Campsites close by include Old Buckenham Country Park. Or you can pre book camping at the airfield. All pics above were taken on my Sony Cybershop Superzoom //ws-eu.amazon-adsystem.com/widgets/q?ServiceVersion=20070822&OneJS=1&Operation=GetAdHtml&MarketPlace=GB&source=ac&ref=tf_til&ad_type=product_link&tracking_id=advinamot-21&marketplace=amazon&region=GB&placement=B00IFEWK56&asins=B00IFEWK56&linkId=e233801f00ef97f4ad64e2f77d62eab1&show_border=true&link_opens_in_new_window=true&price_color=333333&title_color=0066c0&bg_color=ffffff. For example- last week, we toured the Peak District (in Feb so not long days…) We managed 7 nights away, with only one night of electric on night 3. Not once did our 12v battery go and seeing as we only drove 5-10 miles per day, we put this down to the good ol solar panel! When we are out and about our evenings are often spent chilling with a beer, g+t, wine etc listening to music and taking in the surroundings/view. During the winter months, when the nights have drawn in we will often settle in and watch a movie- Keith is a huge film fan, so one of his must have gadgets is something to watch films on. Until only last month, our preferred set up for film nights was 20″ Ultra Slim LED Digital Freeview USB Record TV DVD. Caravan HGV Boat. 12 / 24 VOLT DC 12V + 240 along with Betron Bluetooth Pop Up Portable Mini Travel II Capsule Rechargeable 40mm Speaker For iPhone, iPod, iPad, Samsung, Nokia and MP3 Players for music on the move. 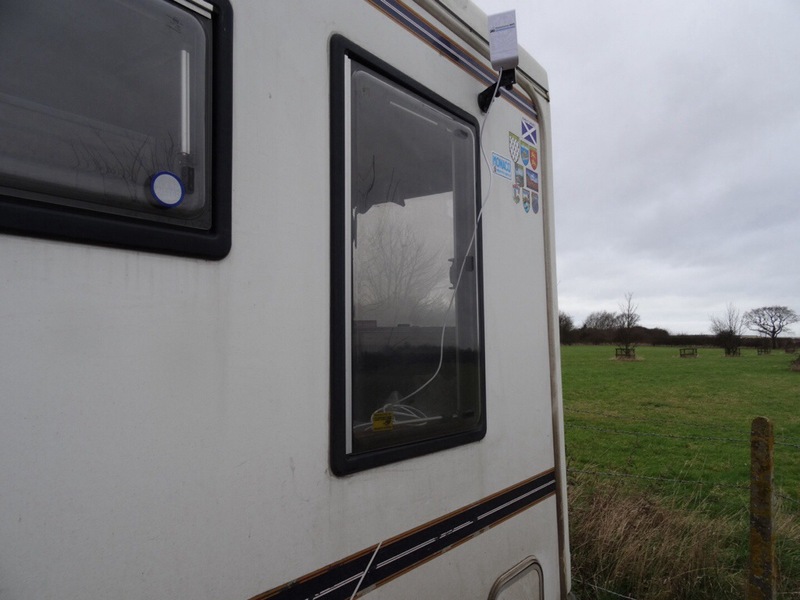 There was absolutely nothing wrong with this set up- we were very happy with the tv system, it plugged in to our 12v plug and we could watch films and tv when “wild camping” and away from electric hook up. The tv itself gave a great picture; the inbuilt DVD player made taking films with us easy; we could play CDs through the TV; we could pick up free view through our arial point whilst on 12v; it was light and easy to store; we could watch tv for a good 6-8 hrs whilst running other 12v appliances (lights, water pump etc) no problem at all- it ticked all our boxes and we were very happy with it. The portable speaker was also a great item- it’s tiny; we could plug it into our phone or ipad and play music at a level that won’t intrude on anyone else’s peace and quiet; our music sounding good on it; it had a fab battery life; it was rechargeable through the 12v; it was ideal for motorhome travel, where we wanted music just slightly louder than what we could achieve through the inbuilt speakers. So why look for something new?! Well, we enjoyed a good 4 years using the above set up, but as we all know- technology moves fast, and we wanted an alternative option- less cables and less things to carry ultimately. Also, Keith’s DVD wallet was becoming as big as the TV itself, so finding something where we didn’t need to carry 100s of films with us would be good! Since getting our 12v TV four years ago, we joined Sky TV at home, and one of the perks (for an extra fiver a month) was Sky Go. This, along with Keith’s Ipad mini Apple 7.9-Inch iPad Mini Retina (Space Grey) – (ARM 1.3 GHz, 1 GB RAM, 16 GB Storage, Wi-Fi, iOS 7.0.4) meant that we could download before we go episodes of series we may be watching, films etc ready to view offline on the road, with no need to carry the DVDs in the van. Now (2015/2016) we are no longer with Sky, however the BBC, ITV, Channel 4 and Channel 5 have all caught up and we download episodes on their iPad Apps. As Bluetooth seems to be the new mode of connecting things – yay, no wires! – we were on the hunt for a new set of speakers that we could connect via Bluetooth. 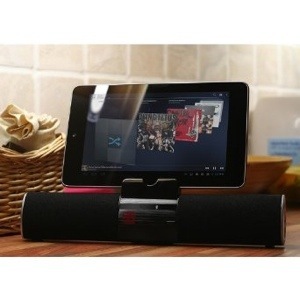 After extensive searching and researching Keith found Sumvision Portable Wireless Bluetooth Speaker Psyc Mako Bluetooth Speaker Stand with Built in Microphone for Smartphone Tablet which have been beyond marvellous! For a very reasonable £15 they are dinky, create a fantastic sound, and best of all, we can slot our ipad in the top so it’s like a mini tv. Nothing I write can emphasise how good the sound actually is- it’s truly awesome, and look how cool it looks with the iPad sat on top! The battery life is wonderful. During our week away we only charged once, and this was because we could, not because we needed to! When it comes to charging,you can charge the speakers via 12v or mains. Perfect. We will still carry the tv when touring the UK, in case we want to catch anything live on the tele, but we can finally banish the expanding DVD wallet to the loft!! Hurrah! As much as we try not to, we can’t help but want to get online when we are away in the van. First and foremost, being self employed musicians means we rely on email for gig enquiries and new student enquiries. Being unable to get online means we can’t keep tabs on our business, let alone keep an eye on our bank accounts, keep in touch with family on longer tours and back up our photos. So as much as we sometimes may crave being cut off from tinterweb, in reality it just cannot be. After 4 years of touring Britain and Europe and relying on our iPhones, and dodgy 3G signal, not to mention an almighty large phone Bill following our last trip abroad (facebook addict alert!!) the time had come for us to invest In a better solution for our internet needs. 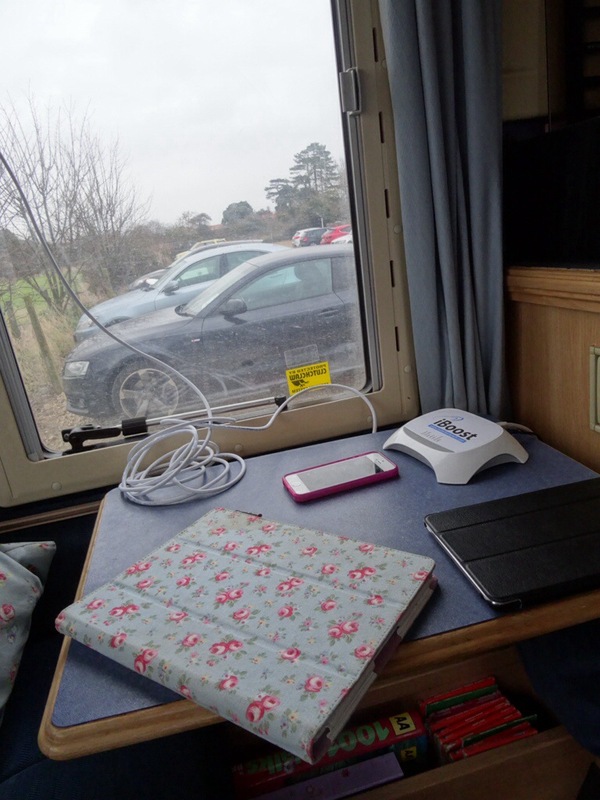 Enter Motorhome Wifi which I’d read extensively about in various magazines, blogs, forums etc. After a lengthily discussion, it seemed that the directional iBoost antenna would best suit our needs, promising to pick up signals up to 1km away. Having just left BT broadband, and signing up to Sky, we would no longer be able to use the BT hotspots (or so we thought) Adam told us about a system that allowed us to buy a Fon account for a one off payment of £34, and this would enable us to still use the BT hotspots. Perfect, and info that we would not have known otherwise, so thanks Adam. We placed our order at 3pm on Monday with the also friendly Sophie, and at 8.30am Tuesday morning it arrived! Outstanding service! 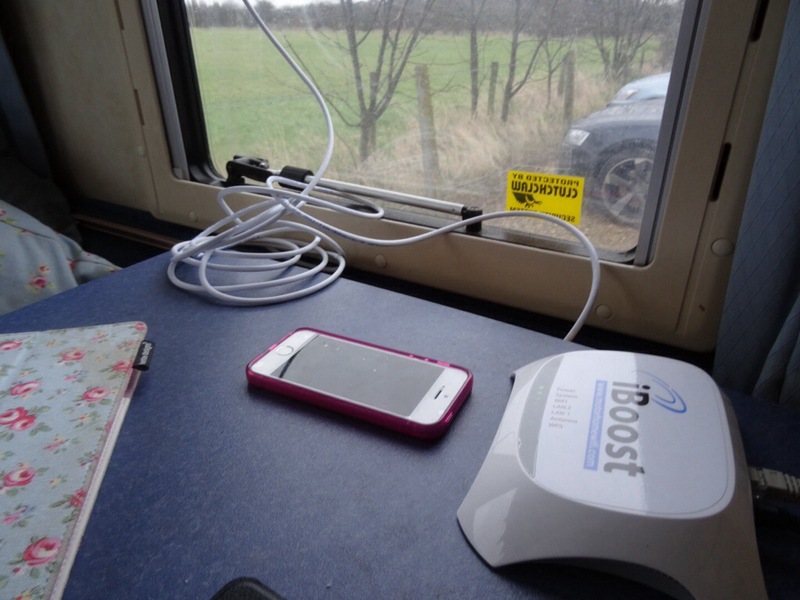 We enjoyed giving it a trial run on our weekend away last weekend, and even at a pub in the middle of nowhere we were able to pick up 4 or 5 BT Fon hotspots, not to mention both pub’s networks. It’s also worth mentioning that without the iBoost, we were unable to find these networks on our iPads, iPhone and Samsung Galaxy phones. The other thing that is worth noting is that the antenna collects one signal and then allows you to connect numerous devices to that one signal- excellent for those of you, who like us, have more than one device. When we used to use BT hotspots we could only log on one at a time as we only had one username. This takes that problem away! Hurrah! So, without a shadow of a doubt, we would give this an almighty 10/10, excellent service, easy to use, and a great product and want to recommend it to anyone else who values the internet whilst on their travels!